Amazon is rolling out a new update for their flagship ereader this week which adds a couple nifty features as well as one which might prove more annoying that it is worth. According to the changelog posted by Amazon, the new update includes three listed features (there could be more, but we'll have to wait for users to find them). Update you Kindle Paperwhite and it will automatically sync your most recently read latest page across all devices and apps on your Kindle account (whether you want it to or not). The update also builds on the existing pan-and-zoom mode for PDFs, adding a small preview window in the margin of the screen. And best of all, Amazon has come up with a smart way to integrate ebook samples with print purchases. Anyone who buys a print book on Amazon will now have the option of sending the sample Kindle edition to their Paperwhite so they can get started reading while the print book is in transit (assuming that the sample is available). This was of course always possible, but now Amazon is automating the process. To learn more, go to Read While Your Book Ships. This update is only good for the second-gen Kindle Paperwhite, and it should be installed automatically. You can also update your KPW manually by downloading and installing the update. You can find more details on the related support page. 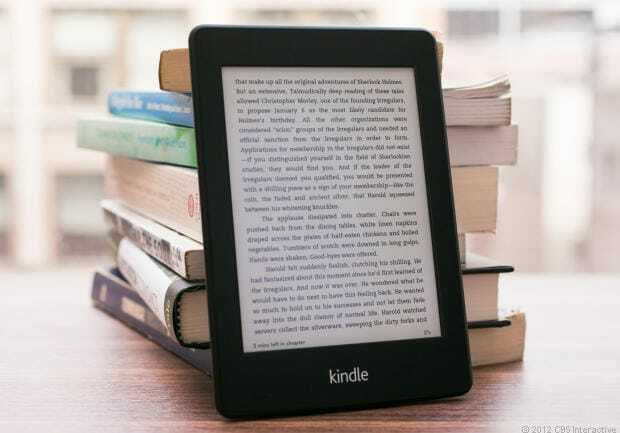 Sync to the Most Recent Page Read Any books you are reading on your Kindle Paperwhite will now sync to the most recent page read across all Kindle devices and/or reading apps registered to your Amazon account. You can still manually sync your Kindle Paperwhite to go to the furthest page read. To learn more, go to Sync on Your Kindle Paperwhite. Preview a PDF in Pan-and-Zoom Mode When viewing a PDF in pan-and-zoom mode, you will now see a small preview window in the margin of the screen. Read a Sample While Your Physical Book Ships While you are waiting for select physical books to arrive at your doorstep, you can start reading the book right away by adding a sample of the book to your Kindle library. With this release, these samples will be now available for download in the Cloud tab of your Kindle Paperwhite in addition to your other supported Kindle devices and apps. Any previous samples you have claimed through a physical book purchase will also be available in the Cloud to download. To learn more, go to Read While Your Book Ships. Nate, please let your sponsor, Blue Bunny, know that their expanding ad is so annoying that I wouldn’t buy their ice cream if it were the only brand in the freezer! I find it annoying as well. I’ve already complained to my ad network. Clearly I’m missing something. How is the new sync option different? I thought my Paperwhite already automatically synced across devices. I’m not sure I see the difference either. I’m waiting to see if someone at MR can explain what’s changed. Okay. Not just me. Be curious to hear what they tell you. Haven’t updated yet, but from the description, it now apparently syncs to the *most recent* page read on any device rather than the furthest read location (which can still be done manually). That is an important distinction and one that I missed, thanks. I also don’t see much difference here from what existed in prior Kindle models, unless this is Amazon re-introducing features that have gotten removed. Seriously, what stopped people from reading a free sample of a purchased book before? Except that PDFs generally do not work like that, which has been their problem on eReaders since the beginning. PDFs are designed to exactly mimic the formatting of the printed page, so the formatting gets hard-coded into the document. This limits readers to pan and zooming on small screens, because they can’t just adjust the font size and have the document flow change. Please don’t install Kindle Paperwhite update 5.4.5 if you frequently read documents with annotations and footnotes. After installing this update, when I tap on a footnote link, nothing happens. The footnote doesn’t appear in a popup box, and it won’t take me to the page where the footnote is so that I can read it there, either. I just called Amazon support and I was told that they have received many calls about this issue, and that they are working on it.